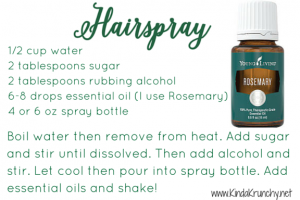 Are you looking for an all natural alternative to chemical laden hairspray? Try this quick and easy hairspray recipe with just a few ingredients and your favorite essential oil! I’ve used it in my hair and curling my toddler’s hair and it is fantastic! Adjust the sugar for more or less hold depending on your needs! Not sure where to start when ditching chemicals out of your bathroom? Check out how to Ditch & Switch! Ready to order your own essential oils? Check how I got started!